“You’re supposed to be in Barcelona?” My mom said while pointing at my brother Tim, (who in fact was in Barcelona less than twenty-four hours earlier,) but he was here now, we all were, because my mom was turning 70, and we felt that was an occasion to celebrate. I have known my entire life that I hit the “life” jackpot being one of my mother’s children. Especially considering I made it just under the wire being the “surprise” number four. :) I never once wanted to upset my mom growing up. I know I did, I was kind of nightmare from ages three – twelve, but my anger was never directed toward my mom; it was directed toward nearly everyone else, but never toward her. Miraculously, I started to mellow out just when most teenage girls start to turn into their evil teenage twin, and I have continued to strive to be a more pleasant and fun person to be around every day since. The strength, kindness, compassion, brilliance, fortitude, and love that my mom modeled for her four children, and two step children, is the greatest gift she could have given to us, and honestly, humanity at large, because we all turned out to be remarkable human beings. Therefore, we were all licking our chops at the chance to pull off a worthy celebration of our mom’s first seventy trips around the sun. The planning kicked off in early January. We went through a few rounds of ideas, but then settled on a weekend in Claremont with the four Kelly kids, Tim, Peter, Mary, yours truly, and my step-brother, Jeff. The last time we were all together with our mom was for our grandmother’s funeral in October, 2013. Yes, I agree, that is a ridiculously long time to be apart; hence why we figured just being together would be the greatest gift we could give to our mom. There was a decent amount of travel involved, my brother Tim, lives in London, Peter lives in northern California, and Jeff lives in Seattle, while Mary and I are tried and true SoCal natives. I offered up taxi services to shuttle Tim back and forth from LAX, while Mary handedly won MVP by doing a majority of the planning with the party venues, and putting together beautiful floral arrangements that she drove up for the Saturday morning soirée we threw for mom and her homies. Peter planned to Uber from Ontario airport to downtown Claremont on Friday morning where he would rendezvous with Mary, while Jeff’s flight landed late on Friday night, (unfortunately missing the original surprise,) but created a fun one of his own by appearing on their door stop late Friday night. Meanwhile, our step-dad Kent stayed in the loop, while leaving our mom safely out of it right up until we sprung the surprise on her Friday night. The four Kelly siblings stand in the center of the room looking at their watches and phones, nervously muttering words back and forth just minutes away from, “GO Time!” Soon they would climb into the black SUV driven by the elder sister, MARY, to La Paloma restaurant to surprise their unsuspecting seventy year old mother, when the youngest, TARYN, perks up cheerily. “Hang on a second, can we just take in this moment for a minute? This is really special.” Because I am the cheesiest of all cheese balls, and I was smack dab in my own version of, “Little Sister Heaven”, I was not going to not acknowledge the phenomenal feat it took to get the four of us, just the four of us, in a room together. I love my siblings more than Scooby Doo loves Scooby snacks, and after nearly forty years of chasing down time to spend with them, and then finally catching it, I wanted to savor those seconds as long as I could. My siblings, and favorite people on the planet, Tim, Mary, and Peter. Still, magical moment’s aside, we were on a mission. Next, the four of us piled in Mary’s tricked out modern day “Mom Car”, a black Chevy Denali, and set off for the two to three mile drive east on Foothill Blvd. toward our mission point, La Paloma, a staple restaurant on our parents Friday date night rotation. I felt like we were a true gang of undercover agents pulling up for a big bust, but that novelty wore off instantly when we saw a line spilling out the door of this local Mexican haunt. It was after 8PM? Really? We hadn’t heard from our step-dad Kent in a while, so we decided to case out the restaurant to see if they were seated already, they were nowhere in sight, so we put our name down on the shockingly long list to get a table, and hid in the shadows out front keeping a look out for our target to land. “They just walked in.” Tim revealed smiling, his droopy jet-lagged eyeballs suddenly springing to life as he pointed over his right shoulder. Yep, there she was. Our regal mother walking into an overly crowed restaurant with only one thought on her mind, cheese enchilada. I readied my camera, and we walked through the door one after the other. Success!! We pulled it off. The Open House at Sanctuary Coffee. There was a lull in the middle of the day where we could relax and re-boot before the final party commenced, an intimate dinner including our extended family taking place at the new, hip restaurant, The Whisper House in the re-vamped section of downtown Claremont. I took advantage of this intermission to scout a course I planned to run my long run on the following Sunday morning. It was one of my favorite workouts, an eighteen mile race-like run with specific paces called out to hit per mile. I usually run it in my neighborhood, so very familiar terrain, but I did not have that luxury this time. Instead, I decided to run up, down and around the first street we lived on when we moved to Claremont in 1987, Radcliffe. I drove up and down it, and even though there was a definite elevation shift, I was familiar with it, and figured a healthy dose of nostalgia could both be a benefit and a fitting way to wrap up such a fantastic weekend. The final party was not a surprise, we let our mom in on everything over the dinner table on Friday night, but it was still a wonderful way to honor our mom alongside our uncle Tad, our Aunt Jan, cousin Beth, and her husband, Pie. Plus, my sister tracked down my mom’s former sister-in-law, Nancy Norris, an incredible woman and role model to my mom who she has always held dear. It was a solid roster of folks assembled to close out the fabulous birthday weekend festivities. He ran that race very well. 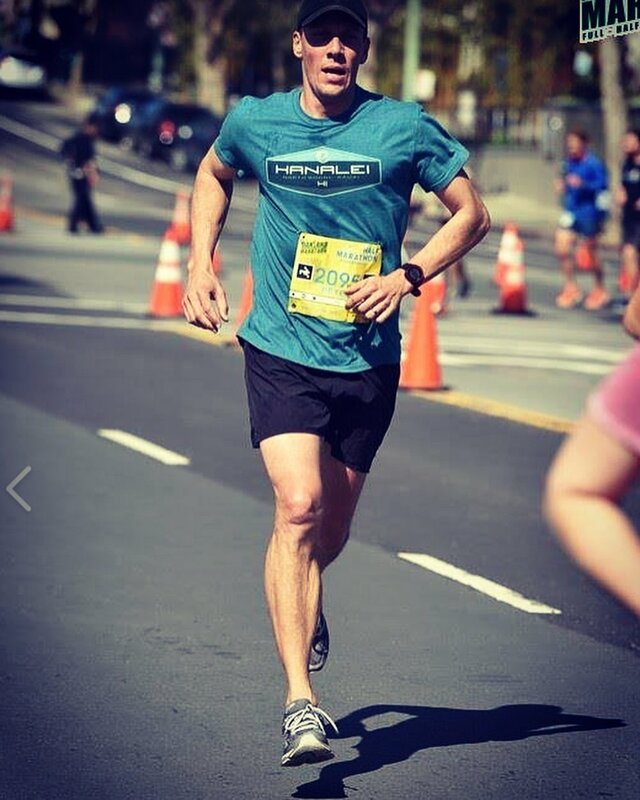 Peter running the Oakland Half Marathon is speedy fashion. I did not have the same pep as Peter did for my long run. My plan to entrench in nostalgia backfired. I felt sluggish and weak running up and down the street that I used to walk and ride my bike up and down every day in elementary school; the incline on Radcliffe is deceptively tough. However, even though I was disappointed with my performance, I was also relieved. I have executed back-to-back-to-back amazing run workouts recently, ones where everything clicked and I felt invincible, but Boston is only three weeks out, and I needed a reality check. I have never, nor do I ever expect to feel amazing every single mile of any marathon I run. Some miles are awesome, sure, but there are always excruciating moments of physical pain, exhaustion, and self-doubt, and I needed to practice feeling those feelings before lining up in Hopkington in three weeks. I ran through those moments on Sunday, just like I will on race day. As expected, I finished my run in just enough time to get cleaned up, give my mom one last big birthday hug, and drive my brother Tim to LAX so he could catch his flight back to London. It was a beautiful day drive through LA, and an excellent way to cap off a very special weekend. Tim, Mary, my mom, kent, my step-brother, Jeff, Peter, and a tall red head.